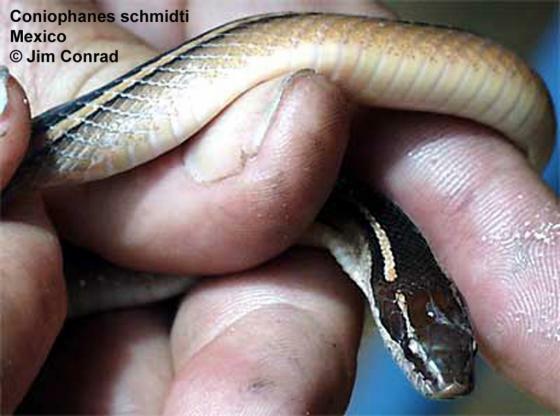 Can you confirm these amateur observations of Coniophanes schmidti? Type locality: Chichen Itza, Yucatan. Comment Wilson & Meyer 1985 speculate that this might be a subspecies of C. piceivittis. Etymology Named after Karl Patterson Schmidt (1890-1957), American herpetologist (see Davis 1957 and RESETAR & VORIS 1997 for biographical notes). Guerra Centeno, Dennis; Héctor Fuentes Rousselin & David Morán Villatoro 2012. Serpientes de Guatemala: Guía para didentificación de especies. Universidad de San Carlos de Guatemala, 186 pp. Wilson, L. D., & MEYER, J. R. 1985. The Snakes of Honduras. 2d ed. Milwaukee Publ. Mus. Publ., Biol. & Geol. No. 6, 150 pp.